Question 1 On what factors does the intensity of magnetic field due to current carrying conductor depends? 1)Take a battery,rheostat,an ammeter,a plug key and a long straight thick copper wire. 2)Insert the thick wire through the centre,normal to the plane of a rectangular cardboard.Take care cardboard is fixed and does not slide up or down. 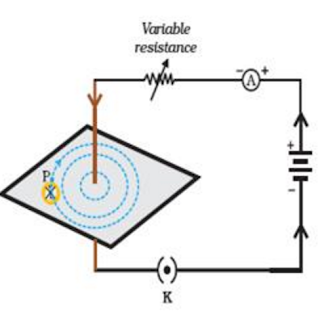 3)Connect the copper wire vertically between the point X and Y in series with battery,plug and key. 4)Sprinkle some iron filling uniformly on the cardboard. 5)Keep the variable of the rheostat at a fixed position and note the current through the ammeter. 6)Close the key so that a current flows through the wire.Ensure that the copper wire placed between the points remain vertically straight. 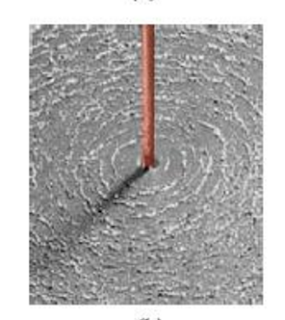 7)Gently tap the cardboard a few times.Observe the pattern of the iron filling.They will show a pattern of concentric circles around the copper wire. 8)Place a compass at a point over a circle.Observe the direction of the needle. 9)The direction of the north pole of the compass needle would give the direction of the field lines produced by the electric current through the straight wire at point. 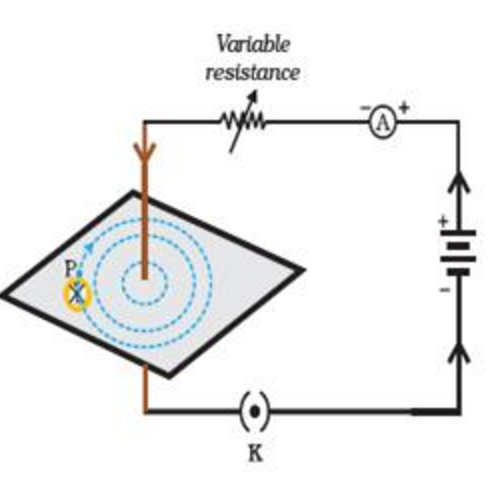 If the current flowing conductor increases,then deflection of needle of magnetic compass placed near conductor also increases and vice versa. If magnetic compass is placed near the current carrying conductor,the deflection of needle of magnetic compass is large but if placed away from current carrying conductor,the deflection will be small.